DETROIT – Today, Bedrock broke ground on its 1.4 million square-foot Monroe Blocks project situated on two city blocks at the corner of Monroe Street and Campus Martius in Downtown Detroit, one year after commencing construction on what will be Michigan’s tallest building on the former site of the JL Hudson’s department store. 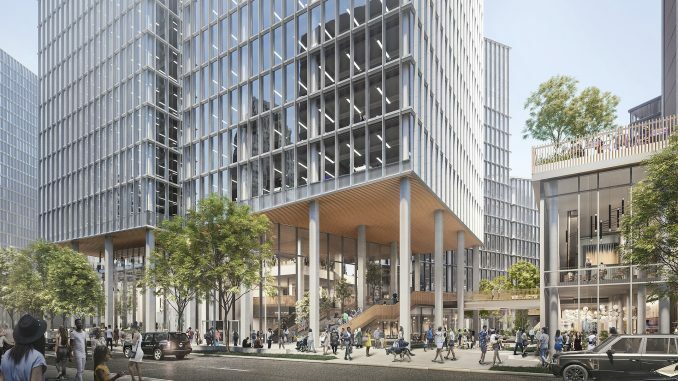 Plans for the massive project include the first high-rise office tower to be built downtown in a generation, as well as more than an acre of open space, nearly equivalent to the size of the adjacent Campus Martius Park. The development is slated for completion in 2022, and will fill in the final missing piece surrounding Campus Martius Park where some of Detroit’s most well-attended events take place, from tree lighting and ice skating to dining and outdoor concerts. Some of Detroit’s most iconic buildings also face the park, including the historic First National Building and the Chase Tower (also known as The Qube), designed by Albert Kahn. Following an international search, Bedrock worked with Danish architecture firm Schmidt Hammer Lassenbased in Copenhagen to design the project alongside renowned Detroit-based firm Neumann/Smith Architecture. The team imagined a master plan that re-introduces historic alleyways and public access points, while prioritizing the public realm both outdoors and in each structure’s ground floor. Monroe Blocks is Schmidt Hammer Lassen’s first U.S. project. Connectthe surrounding downtown districts through intelligent urban and landscape design strategies. Restorea variety and density of uses to the heart of downtown with iconic office and residential space. Createnew vibrant open spaces mixed with retail, food and entertainment for all to enjoy. Todays’ groundbreaking took place on Monroe Blocks Block A, the block located at Campus Martius and Monroe Street. 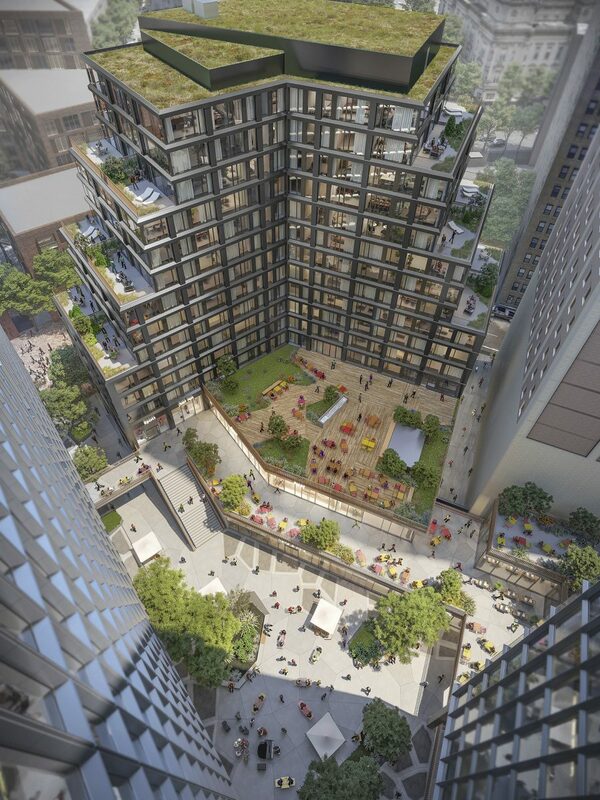 Block A represents roughly two-thirds of the project and will be anchored by a 35-story glass and terra cotta office tower offering a combination of large floor plates, tall ceiling heights and access to sunlight currently unprecedented in Detroit. The structure is designed to be Detroit’s first WELL Certified building, placing emphasis on health and well-being through dozens of criteria related to light, air, water, fitness, nourishment and more. Sustainability is a priority throughout [Monroe Blocks], with the buildings on Block A seeking LEED certification. Block A will also contain a 17-story, 148-unit residential building and a total of 66,000 square feet of retail space designed to attract signature shops and restaurants. 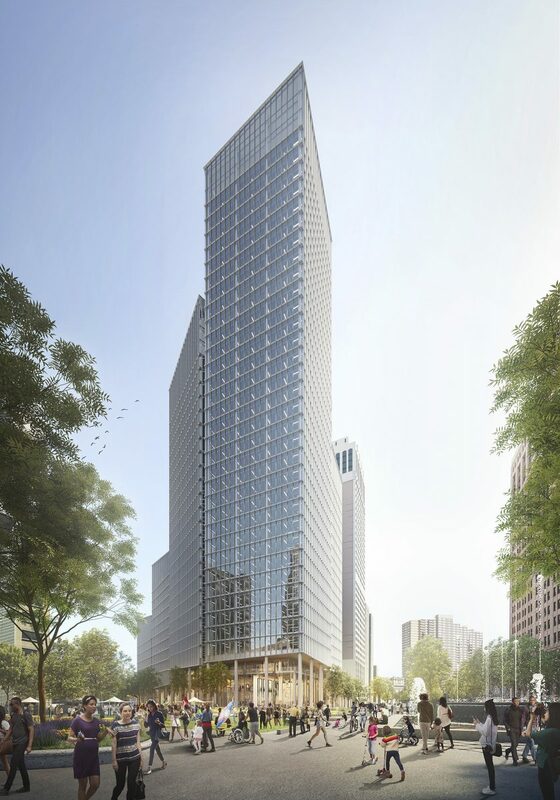 In total, Monroe Blocks will offer 847,000 square feet of office space, an estimated 482 residential units and 117,000 square feet of retail space. Block B, located at Monroe and Randolph Streets, will be largely residential, and designs are still evolving. The two blocks (Block A and Block B) are bisected by a stretch of Farmer Street that will be closed to vehicular traffic beginning January 2, 2019 and converted to pedestrian-only open space. The converted street complements a spacious courtyard at the center of the development for a total of more than an acre of open space at Monroe Blocks. In 2017 Bedrock announced four transformational projects that when complete will add more than 3.4 million square feet of office, residential, retail and open space to Detroit’s Central Business District. Together, these projects represent $2.1 billion in investment and will create up to 24,000 construction and permanent jobs. [Monroe Blocks] is one of the largest among the transformational developments, which also include the Hudson’s Site project, the restoration of the historic Book Building and Tower, and a 310,000 square-foot addition to One Campus Martius. Turner Construction Company, in its capacity as General Contractor for the project, predicts that Monroe Blocks alone require a total of over 11,000 construction professionals to complete. As economic development continues to heat up downtown, Bedrock is committed to making sure Detroiters are poised to take advantage of the opportunities that arise as a result. The Quicken Loans Community Fund and Bedrock were lead investors in Mayor Mike Duggan’s effort to revitalize Breithaupt and Randolph Career and Technical schools. These Detroit public schools serve hundreds of youth and adults and provide the technology-based, hands-on education that expands career options. In November, Bedrock, Barton Malow and Turner Construction Company hosted a massive Ready. Set. Build! career expo at Cobo Center, where over 3,000 job seekers learned about various trades through hands-on demonstrations and video presentations. Attendees met union apprenticeship school directors and interacted with contractors to learn the process for entering the construction industry. The two blocks along Monroe Street that make up the development were known historically as Detroit’s first theater district, lined with Italianate stone and brick buildings built between 1852 and 1911. The site was razed in 1990 with the exception of the National Theater, which was designed by prolific Detroit architect Albert Kahn and opened as a vaudeville house in 1911. The theatre hosted a series of acts after vaudeville went out of fashion, including motion pictures and burlesque. After finally closing in the 1970s, the theatre remained vacant and open to the elements for over 40 years. During that time the structure incurred extensive and irreparable damage. Bedrock is committed to retaining the façade of the historic National Theatre, and incorporating the magnificent terracotta archway into the development. The façade will be carefully disassembled, cataloged, and relocated to span a pedestrian walkway that will bisect Monroe Blocks. The walkway, which is currently a stretch of Farmer Street, will be closed to vehicular traffic and be a part of the development’s open space totaling over an acre. Bedrock’s real estate portfolio consists of more than 330 office and retail tenants in Detroit’s technology-centric downtown, the majority of which are new to the market including Microsoft, LinkedIn, WeWork and countless others. In 2017, Bedrock broke ground on what will be Detroit’s tallest building on the site of the historic JL Hudson’s Department store, one of four transformational projects currently underway within Detroit’s Central Business District. Together, these projects will bring more than 2 million square feet of office, retail, event and residential space to the market. Public art and placemaking initiatives are priorities of Bedrock’s larger real estate strategy. The biannual Downtown Detroit Markets program allows dozens of local entrepreneurs to test market their retail concepts each year, while partnerships with local, national and international artists have helped put Detroit on the map as a can’t-miss cultural destination. Additionally, Bedrock is dedicated to creating jobs and investing in job training. Over the last year, the company has invested in both the Randolph Technical Center and the Breithaupt Career and Technical Center in Detroit to build a pipeline of talent for Detroit’s growing economy. For more information, visit bedrockdetroit.com or engage with us on Twitter @BedrockDetroit and Facebook.